2. Bat rehabilitation – why bother? Gail Armstrong of the North Lancashire Bat Group gave a presentation at the Conference on care and rehabilitation for bats. She had collated data from years of taking in grounded bats and trying to release them back to the wild. She concluded that statistically it did not appear to make much sense in trying to release the bats. Many of them were cat attacked and were unable to be kept alive let alone nursed back to health. But it wasn’t the small number of bats that were released that was the most important. Very few of her bats were able to be released and the potential impact upon populations is hard to determine, but is likely only to be small. Any help though is better than none. The biggest impact of taking in grounded bats though seems to be the communication of details about bats to members of the public. The majority of members of the public never come into contact with a bat and many still seem to have the idea that they are some form of rodent that will damage their house and stop them using it if they decide to roost their. But, collecting grounded bats from the public is an ideal time to talk to them about what bats are and how they live. Being able to show someone how small and in offensive a bat is a wonderful piece of bat conservation. And it’s true. So many times I have collected bats from people who have found a bat in their house or garden and not known what to do. Hopefully, after seeing the bat at first hand and being shown by someone how fascinating bats are they will have a better understanding of why bat conservation is important and how they can help. 1. Lesser Horseshoe bats and buildings. The National Bat Conference was held at Reading University this year. One of the talks was by Henry Schofield of the Vincent Wildlife Trust. The Trust have over may years purchased properties and adapted them as roosts for Horseshoe Bats, particularly Lesser Horseshoes. The talk was a brief introduction to the types of buildings they had adapted and the styles of new bat roosts that had been built. The new buildings were built to look as much like small agricultural buildings or houses as possible. Having undertaken the creation of new roosts over many years the Trust had built up an extensive knowledge of what worked and what didn’t. They had monitored the types of materials used and which worked best, creating hot and cool areas within roof spaces for the bats to use at different times and tried different methods of ensuring bat access but deterring use by birds etc. The amount of information available upon what worked for Lesser Horseshoe bats was wonderful and the talk was ended by promoting a book that the Trust was releasing about the work they had done over the years. The information provided will be invaluable for work with Horseshoe bats but will also help to plan mitigation for other bat species by guiding people what materials are good and what should be avoided. The book comes out in late October but I’ve already ordered a copy. In September and October male bats will be spending time feeding ready for the winter and hibernation, but they will also be trying to attract females to their harem. Male Common Pipistrelle bats add 'chonking' sounds to their echolocation, associated with mating. The most succesful males will gather bigger harems of female during this period. When going out with a hetrodyne bat detector it is possible to hear these 'chonking' sounds. By recording the ultrasound calls through a frequency division or time expansion bat detector it is possible to analyse the sound on a computer. I have recently been recording Common Pipistrelle bats at a roost with a Batbox Duet frequency division bat detector. This detector analyses all of the ultrasound and divides the frequency by 10 in order to make it audible. The information can then be put into a program, I use batscan, to produce a a sonogram, a graph of the sound frquencies of the call. 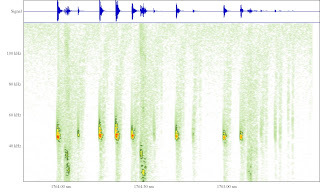 This call shows the lower frequency 'chonk' sounds that the bat is making, as well as the normal echolocation calls. I’d collected a bat from a school. It had apparently flown into an office and was picked up and put into a box with some shredded paper. By the time I arrived the milk bottle top in the box had been spilt and the bat was soaked. Taking out one very bedraggled and sorry looking bat I showed all of the staff how small bats really are. I was on my way back home with the kids so they all came in to help. Having seen plenty of bats before they were not phased by any of it. When we got the bat home I had another look at him and checked him out in more detail to make sure there was not damage. Because he was soaked and looked very small I did not have too much hope for him but we dried him off and put him into a larger box with space to hang and fresh water. A little later I took him out and the kids helped me feed him mealworms. They helped by chopping off the head and gently rubbing the mealworm around the bats mouth so that it got the taste and smell. Sure enough in a few minutes we had him eating mealworms. Over the next day or so he began to take meal worms from a bowl that we just topped up a couple of times a day. Within a few days he was eating happily and had put enough weight on to allow him to be released. With the kids we went to the school and stood on the grass outside one evening when the weather was good, and the forecast wasn’t for rain for a couple of days. A miracle in that part of September! With gloves on the kids held the bat and warmed him up, feeling him begin to shiver and warm him self up. After about ten minutes Rose said that he was getting very wriggly. I told her to open her hand more and let him crawl up the glove to the edge of her hand. To everyone’s delight he spread his wings and dropped off her hand, flying off. He flew around in circles for a few minutes and then he was off. The kids really enjoy telling their friends about helping the bats. Not everyday in most peoples households! All good publicity for bats and bat conservation. As the weather begins to get colder in October insects become fewer. All British bats eat insects and therefore their prey/foodstuffs become less. Bats can handle the colder weather because of the fur on their bodies and because they are mammals. But there will come a point when the energy expended in catching insects is greater than that available from the insects that are around. At this point the bats will decide it is better to stay in their roost and slow their body down, go into torpor. In the cold of winter bats will hibernate, but before they get to this point they have to eat as much as possible in order to put weight on ready for hibernation. So slowing their body down in torpor is like a mini version of hibernating. They use very little energy/fat and can last long terms between feeds as the weather gets colder and the insects become fewer. Bats don't have back bones - do they? We went to collect some grounded bats that had appeared in an office at a hospital. The call had come because there were 15 bats in the office when someone entered the office in the morning. They opened a window and locked the room. When we got there to rescue them there were only 6 hanging on the curtains, the others presumably having flown out of the window. As usual with these things everyone wanted to see the bats and be told about them. One gentleman who was dressed in what appeared to theatre overalls was very animated about looking for bats. He was clearly interested in wildlife and had seen bats at some point. He did however let himself down by saying that ‘bats don’t have back bones, do they?’ Quite where he’d got the idea from we never knew but he was convinced that bats did not have a back bone. How else could they crawl into such small spaces! We had to explain that the majority of the bat that you see is fur and that the body underneath is really very small. This is the reason they can get into such small spaces, not the ability to be a slug! People get the strangest ideas. The bats were taken back that night and released. Hopefully they won’t return to the hospital. It seems to have been wet for ever. Not the extreme weather of last year. Just continuously wet and damp. Bat surveys can’t be done in the wet and bats can’t forage. I did one bat survey, arriving on site fifteen minutes before sunset, and there were Common Pipistrelles already feeding amongst the trees at the end of the garden. It had rained for a couple of days before so the bats were hungry. The evening was overcast, so the light level was low. Hungry bats had therefore come out earlier than usual. Braving the possibility of being picked off by birds of prey, in order to get fed! The books say that Pipistrelles will come out about fifteen to twenty minutes after sunset. But, should we rather being saying that bats will come out at certain light levels? Bats don’t watch the clock. They don’t read the books about what they are supposed to be doing. They must have some sort of sense about when the light level is right for them to go out, and not be liable to be someone else’s dinner. So, should we be measuring the light levels when the first bats emerge? A talk with another bat worker who understands technology better than I do led to an idea that you could use the old style light meters used with 35mm cameras, and available second hand. The light levels on the meter should be able to be correlated to light levels measured in Lux from a light meter. This would allow light levels to be measured in a standard unit that could be used any where. Measurements could then be compared between sites and at different times of the year to see if there are any patterns about emergence. I am a Chartered Surveyor and a Natural England Licensed Bat Worker working in the West Midlands. As a Natural England Volunteer Bat Worker I do householder visits to help with Bat Conservation. In my capacity as a surveyor I undertake bat surveys and consultancy for property development where bats may be involved.